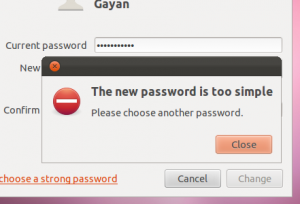 How to Skip the "new password is too simple" Message in Ubuntu Linux? Because having a strong password does make a difference, when we’re setting up a password in Ubuntu it checks whether if it is strong enough or not before accepting it into the system by based on few things (the number of characters, whether if it has digits and punctuation marks etc). So, if you entered a simple or a “weak” password, then the OS might give you an error saying that you have to enter a new, more stronger password and the current one is unacceptable. Recently I wanted to change my password in Ubuntu Linux (using 11.10 Oneiric Ocelot) but while trying to do so, it gave me an error in user account management tool as shown below. Now the best thing one should do here is to enter a more secure password but I just wanted to enter my old one but while using this utility I couldn’t do it. Luckily, for the good or the worse the “root” (also known as “sudo”, though “root” is a bit powerful than “sudo” in technical terms) user in GNU/Linux is the ultimate authority thus such restrictions simply aren’t valid to him/her, and you can use the command-line with ‘sudo’ privileges to change the password. All I did was, fire-up my Terminal window and entered the below command which solved the “issue”. Replace “gayan’ with the name of the user that you want to change the password, you’ll have to have administrative privileges to do this (obviously) and then follow the on screen details. Interestingly the user account tool (GUI) that you get after installing Ubuntu won’t let you do it, it is actually possible on the Ubuntu’s installation wizard as you can enter a weak password and the OS will give a warning but it’ll accept it into the system. Anyway, if you wanted to change your current password into anything you like (even a single character, ahh the wildest dream of every hacker! ;-)) that is one way to do it. Good luck. On Ubuntu 10.04 it does not work. Computers should not parent users! It is ridiculous! If I want my password to be ridiculously easy to guess, I should be warned, but if I ignore it, that is my problem! Worked fine, thank you. I suppose if it is expected that a complex password is always used then a simple one is not a problem. Well, that's one way to look at it ;-). You are welcome mate! :). Doesn’t work on 13.10 the shown enter password thingy comes up, then no matter what you type (and after you press enter) it says sorry try again, and again and again 3 times then just says 3 incorrect tries. I just tried it on Ubuntu 13.10 (for a ‘standard’ and an ‘administrator’ account) and it worked. Please check the following before trying again. 1. Before entering the command, make sure you’re logged into a user account that has administrative privileges. 2. Then upon entering the command (sudo passwd username), when asked, enter the administrative password of the currently logged in user to authorize the command. 3. Once that’s done, then you’ll be asked to enter a new password for the user account that you wanted change (you’ll have to enter it twice to conform), and that’s it. I agree with Eduardo that an OS should not parent us. A warning would be enough. But tnx anyway, and newcomers in linux are too often bombarded with geek explanations, this one was quite simple ! Thanks Worked on Zorin OS 11 (Ubuntu derivative).